Have you ever thought of what it would be like to discover an old box filled with precious jewels? Travel to Dresden and you can do just that. Once regarded as a jewel box for its lavish architecture and art, Dresden was nearly destroyed during WWII by air bombs. Today, after many years of restoration, the city once again offers a dazzling display of gems waiting to be experienced. Dresden’s city center is packed with historical landmarks such as the Frauenkirche. Also known as the Church of Our Lady, the Frauenkirche is one of the most famous cathedrals in the city. Still under reconstruction from the damage received during the 1945 bombings, the cathedral is a spectacular sight to see both inside and out. You can also climb the stairs to the top of the tower and see amazing views of the area. The Bruehl’s Terrace is another historic site not to be missed. Formerly the private gardens belonging to the Count of Bruehl, the Bruehl’s Terrace is a wide open plaza nearby the scenic Elbe River. The terrace is a popular place to wander around and dine at an outdoor cafe while gazing out over the beautiful river. You can also explore the area beneath the terrace to see the ruins of a medieval fortress that include a 450 year old brick gate, old iron door hinges, battlements, trenches and other artifacts. A visit to Dresden would not be complete without a tour of the the city’s most popular attraction, the Zwinger. Built in the 1700s, the Zwinger is a magnificent palace complex where you can awe over the marvelous Baroque architecture and interior that includes ornate sculptures and paintings by famous masters of art. The complex also houses museums where you can see interesting collections of artifacts such as old weapons and armor once worn by adults, children and horses. The Green Vault is a must see while in Dresden. Tours require reservations but are well worth it. Built in 1723, the museum houses some of Europe’s most dazzling treasures, which consist of around 3,000 pieces of exquisite jewelry and other objects made with precious gems and materials. You can feast your eyes on sparkling gems like diamonds, emeralds and sapphires as well as a green diamond. See breathtaking bronze statues, fine arts, gold and ivory objects. Located on the banks of the Elbe River, the Japanese Palace was built in 1715 to house the collection of Japanese porcelain belonging to Agustus the Strong. Today, the Japanese Palace is a complex of museums that include the Museum of Ethnology Dresden and the State Museum for Pre-History. Regarded as one of the world’s most beautiful opera houses, the Semper Opera presents outstanding opera, ballet and jazz performances. Even if you don’t catch a show, a tour of the opera house is a must do in order to see the gorgeous interior. The Albertinum Museum is a popular art museum where you can view marvelous collections of sculptures, jewelry, romantic paintings and more. Dresden plays host to several annual festivals such as the Dixieland Festival, the largest Jazz festival in Europe, held in May. The Film Festival is hosted from June to August on the banks of the Elbe River where you can watch films on an enormous outdoor screen. Beginning in November and lasting until Christmas, the Striezelmarkt is a Christmas market that attracts many visitors looking for unique items and a great bargain. Dresden offers plenty of hotel options whether you are on a budget, family vacation or romantic getaway. 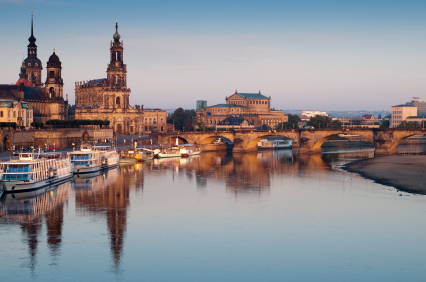 Don’t miss out on the opportunity to see the treasures of Dresden. Begin making plans to visit by checking out these online hotel deals today!